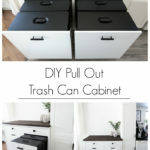 Learn how to make your own pull out trash can cabinet and finally organize your trash and recycling! 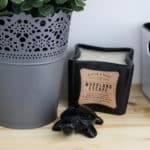 Making your house into the home you love is not an easy process. We’ve been working on this out-dated house for over a year and we are no where near done. Rooms are finished in phases. We don’t usually have the time or money to finish an entire room the way we want it finished all at the same time. Take our kitchen for example. One day we plan to do a major renovation. I’m talking custom cabinets, new appliances, the whole nine yards. But we are pretty far away from that day. 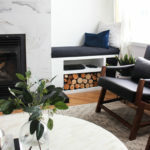 So in the meantime, we did a quick “weekend renovation” with some quick fixes so that we had a space that we could still enjoy for the next few years, but even that didn’t solve everything. 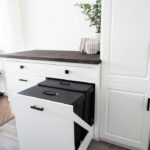 We’ve had this little corner of the kitchen that’s been driving me crazy since day one, and we’re finally solving that problem with our DIY Pull Out Trash Can Cabinet. Here’s our problem situation. First, we’ve had a trash can without a lid for over a year now. Luckily, with three children, we go through enough trash regularly that we don’t ever have a stench in our house, but it’s gross. Second, our recycling has never really had a home. Sound familiar? I mean, we’ve had a place outside to bring it all eventually, but usually it just piles up on top of our water cooler until one of us gets so annoyed with it (and/or the pile crashes down around us! ), that we decide to take it all out. It’s the worst. Our solution? Build a cabinet to hide all of it. We had a space at the edge of our kitchen that was asking for more cabinetry. 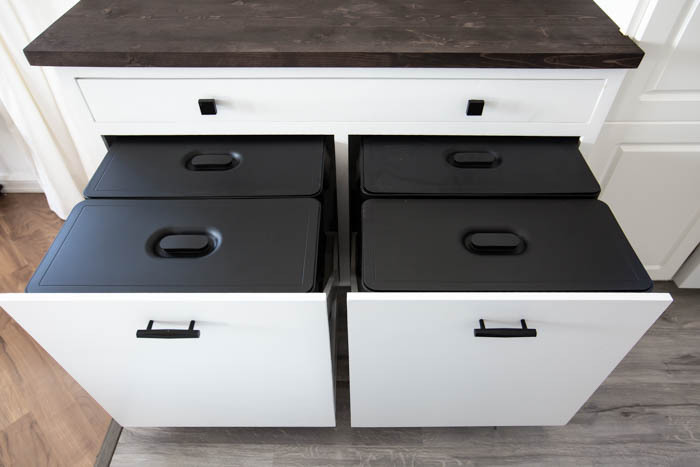 There were a couple of things we wanted out of our cabinet: for it to match the counter height in the rest of the kitchen, for it to blend in decoratively, and for it to be able to house four bins nicely. We wanted four bins because we needed a garbage one and we split our recycling into three different groups here (cardboard, plastic/tin/glass, and bottles). 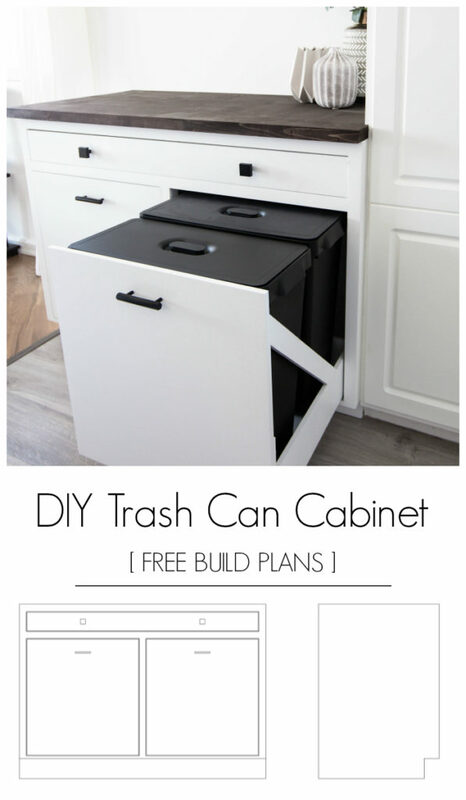 How to you build a pull out trash can cabinet? 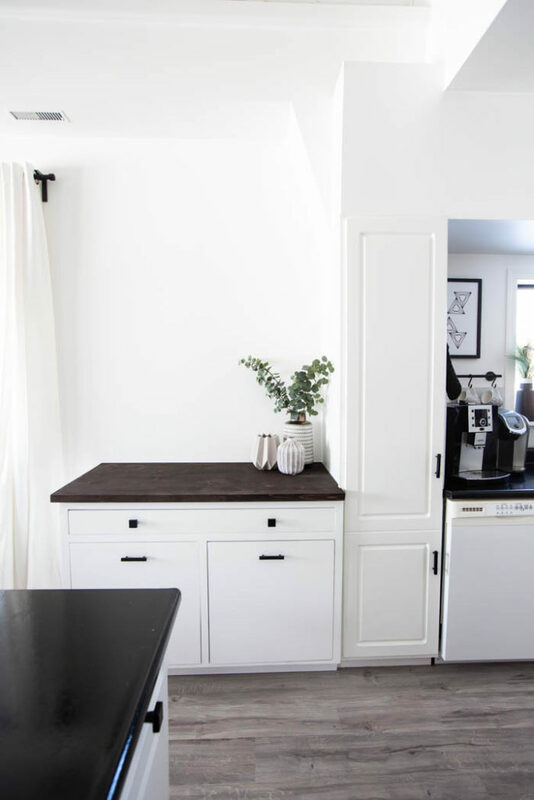 Before I show you the free build plans, here are a few things to think about when you are planning a custom cabinet like this. Drawer slides are so important! 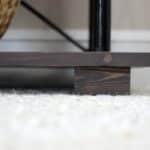 It’s worth spending money on a higher quality slide so that they are easier to install and work smoothly. Whatever slides you use, make sure you check they are square and check all of your measurements constantly as you go. 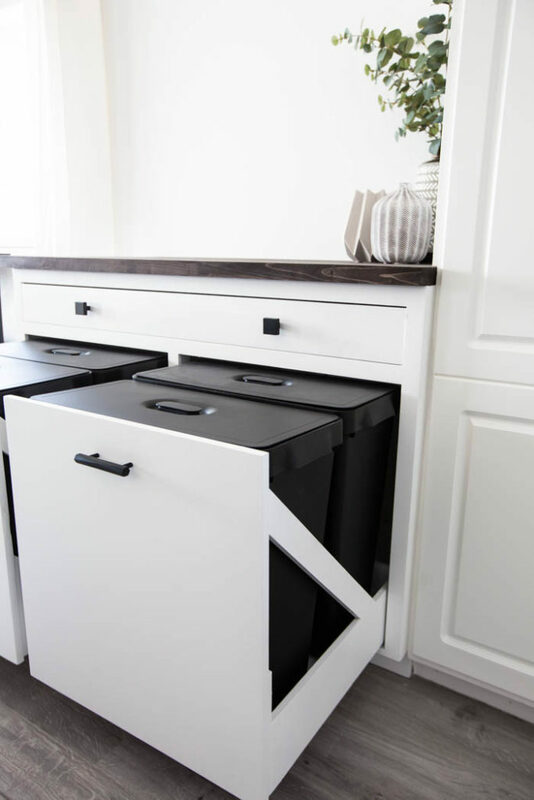 Accuracy is very important for smooth opening and closing of drawers. 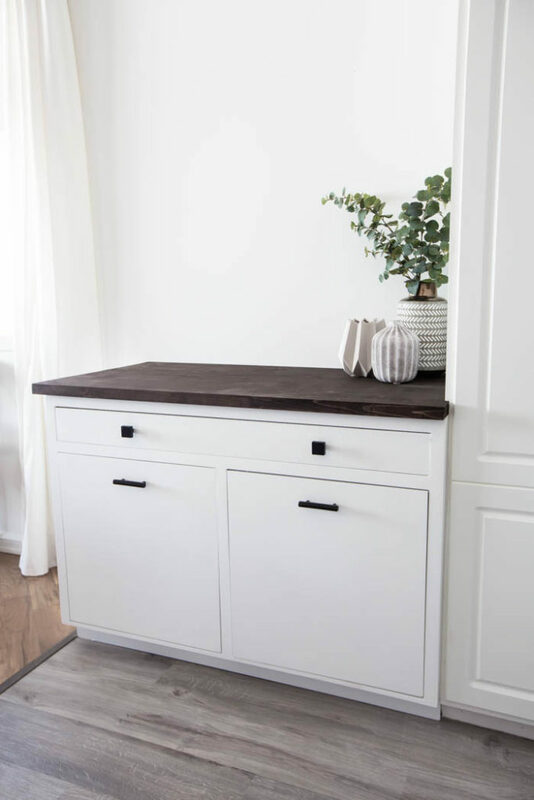 We made a wood countertop for ours and stained it with Kona from Rustoleum because we love the look of the wood and we are planning some floating shelves above the cabinet. 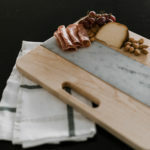 But any other countertop material will work too, if you want to match your existing countertops. We used a few Kreg tools to help us build this, including our Kreg Router Table and a Kreg Pocket Hole Jig. The router table makes cutting all of the grooves for your drawers easy and efficient. 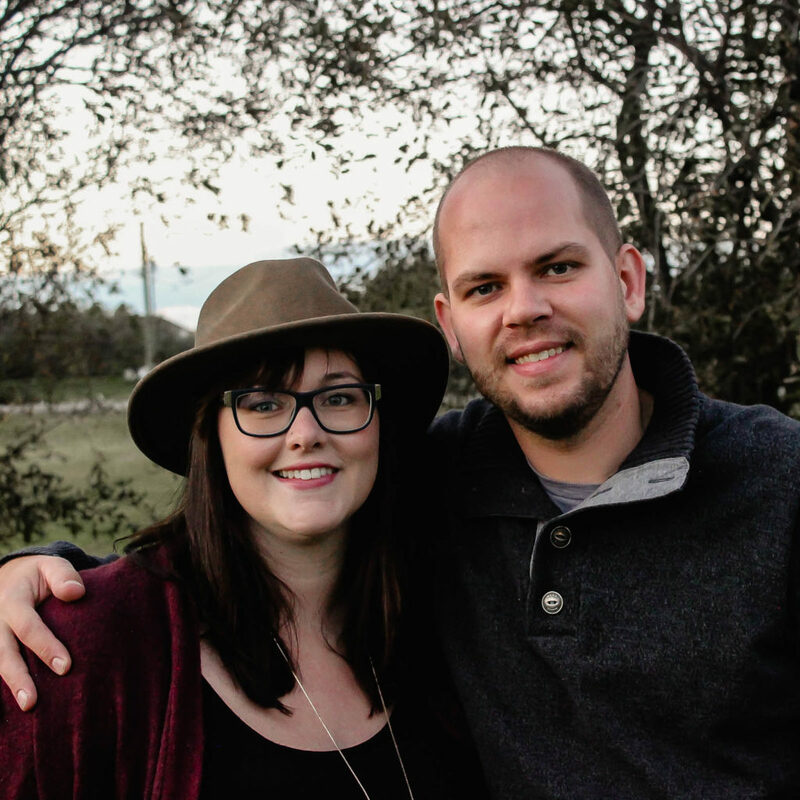 I actually bought our router table for my husband as a Christmas gift when we were first married, and had no idea how much use he would get out of it. If you haven’t used a pocket jig to conceal your joinery, you need to run and get one right now! We honestly use ours for almost every build we do. 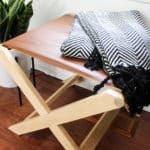 We all love this bench already and since I teamed up with Kreg Tool Company and Build Something you can grab these FREE build plans now! 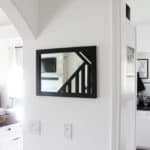 Build Something is the DIY project site from Kreg Tool Company where they share great DIY build projects and plans. If you like building projects, you will definitely love this site. 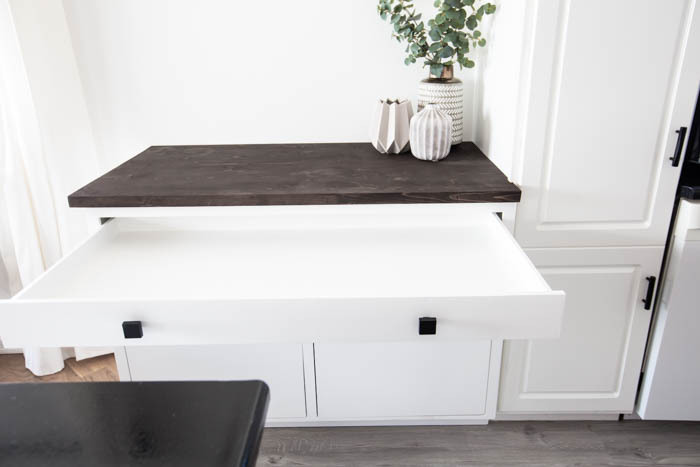 And don’t forget to check out the free plans for this cabinet! 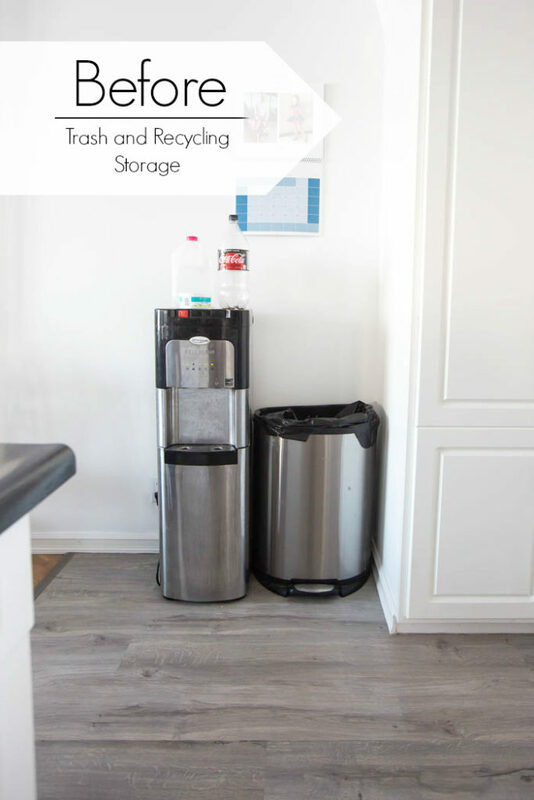 What do you think of our hidden trash and recycling center? 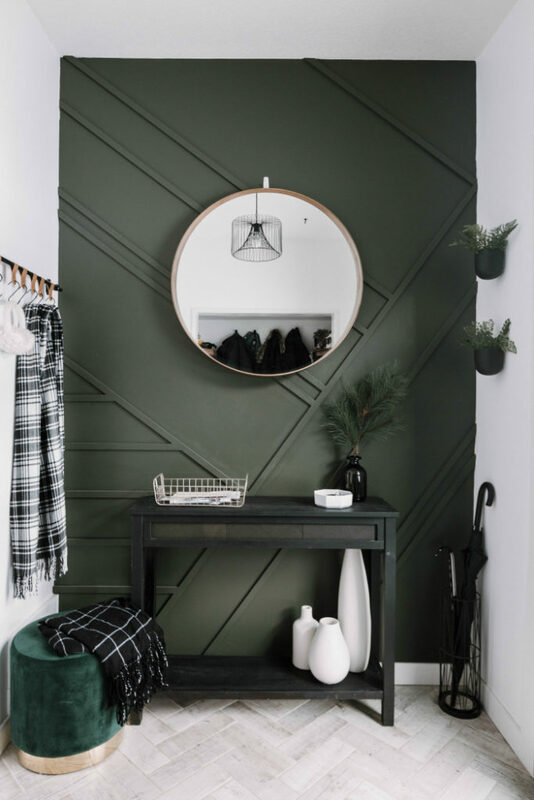 If you’re looking to add some character to your home, check out the tutorial for this easy Wood Accent Wall! 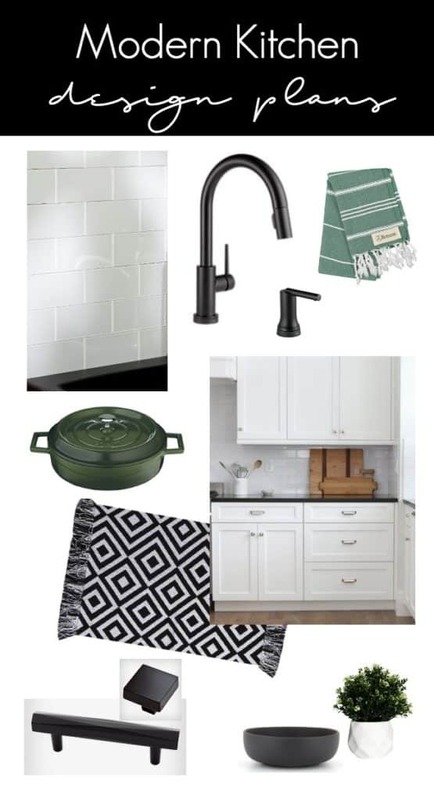 If you’re curious about the easy fixes we did to our kitchen, check out our Kitchen Makeover Plans! What a brilliant idea! LOVED following along on Instagram, it turned out perfectly! Thank you! It was a fun build project! You guys are amazing! This looks so good! Stunning!! What an improvement. Way to go!! Thank you!! I’ve been waiting so long for this! Glad we finally found made something! So great! 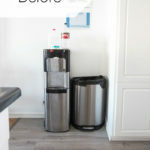 I was just thinking last week how handy our pull out trash can is (and wishing we had more for recycling). Yours looks great and reminds me of a side buffet table or china cabinet.